Kluddolon are Galatian shortswordsmen. They are readily available, cheap, have a good charge and can hide well. They are extremely vulnerable at range. The Kluddolon (Klud-oh-lon; "Sword Bearers") make up a light levy of Galatian warriors. They are young, and fairly unreliable due to this. However, they part of the common levies that accompany Galatian chiefs; as such, mercenary Galatians would be accompanied by many men of this class of warrior. They are used as light, mobile warriors to hit in short strikes, or used on flanks. They were also historically used to break phalanxes. 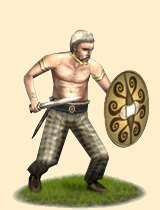 Historically, Galatian mercenaries were very popular with any who could afford to hire them, and were also reputed as maruaders. The shortswordsmen were a valuable part of a Galatian force; they would be used to get under a phalanx and gut it before heavier soldiers would enter the breach and cut down the spearmen from within. As such, the seemingly very light, weak infantry could be a very feared part of a Galatian force. Their name is a from the Galatian Celtic; a form of Gallic with very overt Greek influences.